I’m finally learning to pack a camera full-time, in this case an old 1998 Nikon pocket camera which has its problems but still mostly works. In this case I was returning to Quartzsite from a grocery shopping spree in Parker, and saw some guy very carefully pulling out from a sidestreet. He was being careful because each of those ATVs probably weighs about 600 pounds, and with their center of gravity six feet in the air, even dodging a pothole can be interesting. 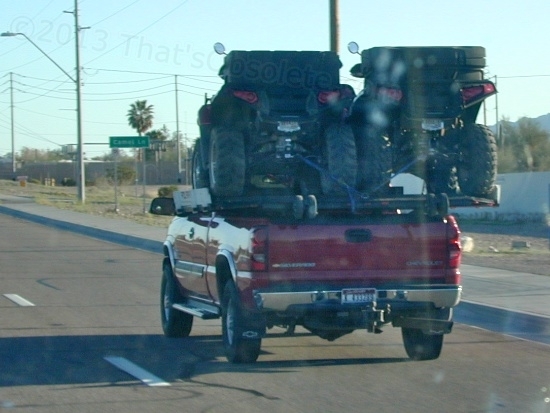 The usual practice for one ATV is to simply drive it into the bed, and the usual practice for two is to drive them up from the side onto a platform over the bed. Like this setup, both are high in the air but at least are positioned above the bed’s centerline, one in front of the other. I thought that was insane. This guy’s bed is too short to take the ATVs in line, so he’s got them straddling the bed’s centerline. Maybe the combined CG of the pair works out to the same – I’m no engineer – but I can say that first, he was changing lanes and turning very carefully, and second, he will face some serious excitement if he ever has to face a situation that forces him to quickly deviate from a straight line. Sometimes, brakes aren’t enough. Bonsai! Bonsai! Bonsai!